California community colleges aim to increase graduation and transfer rates by nearly 227,000 students over the next decade. California’s community colleges intend to increase graduation and transfer rates by nearly a quarter of a million students over the next decade, officials said Wednesday in announcing an “ambitious goal” to boost student success rates. The effort, part of the California Community Colleges Student Success Initiative, is intended to increase the number of students who obtain certificates or associate degrees or who transfer to a four-year institution by 227,247 students by 2023-24. That would require boosting the completion rates for students in degree or transfer programs from its current 48 percent to 63 percent. Completion of career education programs would need to rise to 70 percent from its current 54 percent. 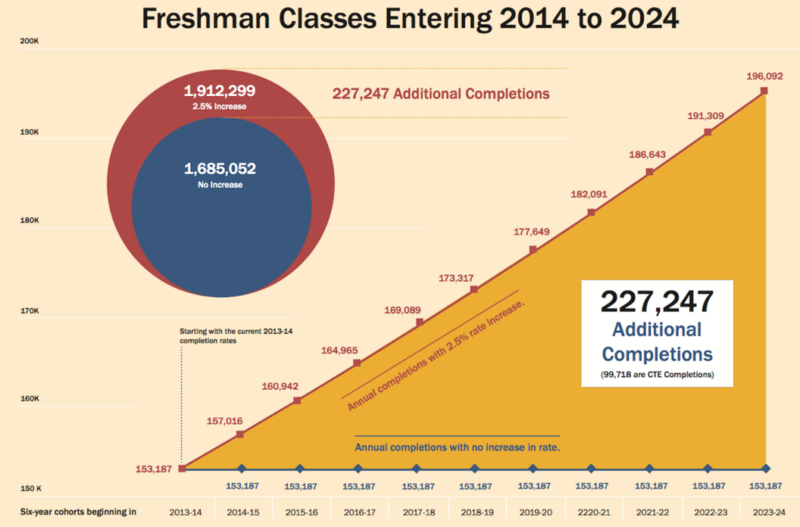 Some 153,187 community college students completed degree, certificate or transfer programs in 2013-14, according to information from the state community colleges system. “This is probably the most ambitious student outcomes goal effort ever undertaken by our system and quite frankly in the country,” California Community Colleges Chancellor Brice Harris said during a conference call announcing the effort. The goal relies heavily on increasing the number of students who pass remedial classes and speeding those students’ entry into credit-bearing courses, Harris said. About 75 percent of incoming community college freshmen require remedial work. Several campuses have had success with targeted placement and assessment programs that put students into the classes they need and focus their studies on key areas requiring improvement, among other efforts, Harris said. “The challenge is scaling that up to the huge numbers of students that are underprepared,” he said. To help boost success rates, campuses will also offer priority registration to students who participate in orientation and educational planning services, officials said. Community colleges will also improve support services to keep students on track, as well as streamline transfer processes to California State University campuses. California has the largest community college system in the nation, serving more than 2 million students at 112 campuses. The push comes amid a concern about the length of time students require to graduate college, as well as concerns about a shortage of trained workers for emerging jobs. Wednesday’s announcement puts a number on student achievement goals outlined in the Student Success Initiative, created in 2012. That initiative aims to bolster student success, graduation and transfer rates by improving support services and providing more targeted academic counseling. The community college budget includes $170 million this year for the initiative, with the money being distributed to local campuses based on enrollment levels. “A lot of those dollars are going to be invested at the local level to improve basic skills and remediation,” Harris said. I have a number of issues with this article. There have been various other “task forces” and statements about what the community colleges “ought” to be doing in the interim, but as far as I am aware the Master Plan is still the defining document. CA has always had this great “second chance” available for its residents, young and old, to seek to further their education. The “tone” of the article and the Chancellor seems to imply that providing this second chance is some kind of great burden that the system has been asked to shoulder. No, it’s the actual job of the system. 1) Students need to be rushed through the system with maximum speed to increase “efficiency” (think of “I Love Lucy” and the classic candy factory assembly line she and Ethel are working on). This is about education which has values that transcend “efficiency” in the simplistic business sense. 2) This “efficiency” is necessary because we live in a time of diminished expectations and resources (aka, “austerity” for the 99%). No, we live in a time when many in CA have been conned into thinking resources aren’t available when they are. It just takes political will to access them. There is no reason why the wealthiest state in the nation should have a community college system that is starved for resources or a K-12 system that is funded at the lowest level in the country. Time to look beyond the red herrings of “too many remedial courses” when remedial courses are a primary function of the system. 3) And then there’s the “concerns about a shortage of trained workers for emerging jobs.” If they are “emerging” nobody knows for sure what they are or what the necessary skills are. As Paul Krugman pointed out in a recent NYT article, if there were huge skilled worker shortages in certain sectors you would see complementary huge salary increases in those sectors as businesses competed for workers. You don’t see those “huge increases” anywhere. Wages for college educated workers, though higher than those of non-college educated workers, have been relatively flat for a decade or more. Of course! That’s where they are supposed to go. Hey, Gary, that was a jonronazo. If the community colleges don’t want to do that, let them and the Legislature work on modifying the Master Plan. But this probably will never happen since nobody wants to admit that the state will never pay for the seats required to get everyone that does not want a career into college. The funds for the FTEs that will do the teaching are not there. Unless, of course, the aim is to privatize UC and maybe even CSU. The cynics out there would say this process is well on its way since one third of the entering freshman class at UCB and UCLA are from out of state.